Do you suffer from chronic physical pain? Have you sought help, but still feel little or no relief from treatment? 1) A person is holistic — you’re an integrated being made up of many overlapping functions, organs & systems that work together & affect each other on many levels. 2) Your body works to stay in balance, be healthy & heal itself. 3) If one part of your body is in pain or is restricted in its natural movement, the rest of the body tries to adapt and compensate. Unfortunately, over time, this compensation can often lead to inflammation, pain, stiffness and other health conditions. 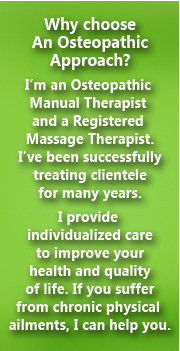 Osteopathic treatment assists in returning your body to optimal natural movement and functioning. Bodywork therapy and the various exercises I often recommend can ease pain, reduce stress levels, increase your mobility, and most importantly, provide an opportunity for your body to heal itself. Osteopathic Manual Therapists use a broad range of gentle, hands-on techniques, including soft tissue stretching, deep tactile pressure, and mobilization or manipulation of joints. After an assessment of your health and difficulties, I begin a process of osteopathic adjustment. This works to bring all the parts of your body into their proper range of motion. By working on the available motion your body has, and by gently calming the nervous system through rhythmic touch, the body releases its ‘guarding mechanism’ and begins to move properly. When your body is moving properly, it allows the regular motion of the circulatory system, the lymphatic system and the venous drainage network. When the body ‘ebbs & flows’ the way it’s supposed to, you’re more able to purge toxins, waste, and also increase your oxygen & nutrients uptake.